I am so over winter. SO over it. I know, I know, everyone feels the same way if they live in the Midwest or on the East coast. It has just been brutal this year! I think it will be May before the foot of solid ice in my yard has a chance to thaw. I live in constant fear of pipes bursting. I feel like I am on an obstacle course while driving in Chicago to avoid the thousands of cavernous potholes. Enough whining. I really do like to look on the bright side of things! In winter that means looking forward to warm vacations, cozy nights by the fireplace, binge watching seasons of a new favorite show (Downton Abbey) on Netflix, and warming comfort food. 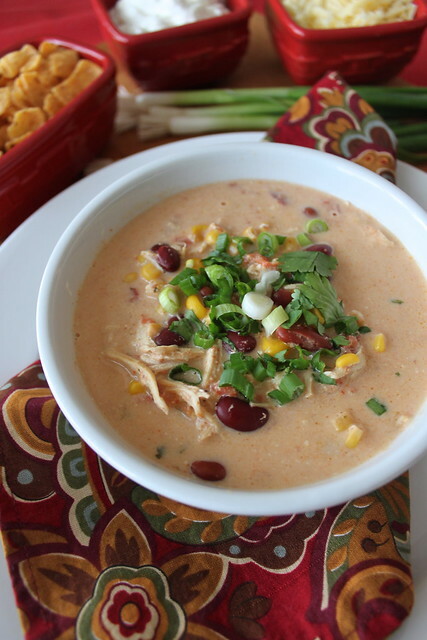 This Southwestern Slow Cooker Soup totally fits in the last category! My cousin told me about this recipe and I am so glad she did, it is delicious. It is also one of the easiest meals I have made in a long time. You just fill the slow cooker with the ingredients and walk away. You can even put the chicken in frozen! I used spicy Ro Tel tomatoes and chipotle chili powder which made my version really spicy. If you are sensitive to spice you might want to use the mild Ro Tel and cut back on the chili powder. This makes a big batch so you could cut it in half easily. 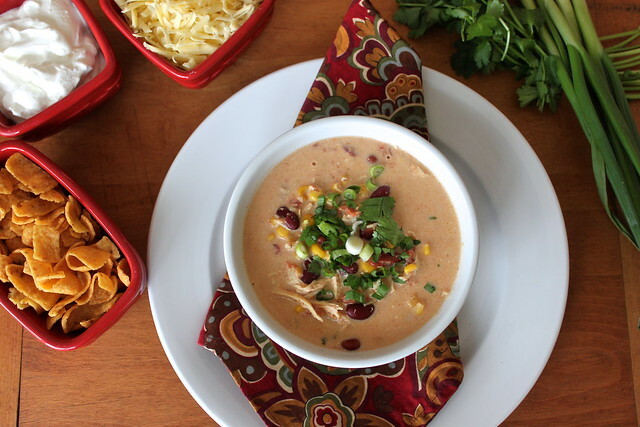 This soup just screams for toppings! I recommend shredded cheese (cheddar or Monterey Jack), green onions, cilantro, Fritos (why do they have to be so good? ), and sour cream. Place the chicken breasts in the bowl of a slow cooker. You can even put the chicken in frozen. Add in the remaining ingredients, through chicken broth. Stir to combine. Place the cream cheese on top, but do not stir. Cook on high for five hours, or on low for 8 hours. Remove the chicken and shred with a fork, return to soup. Stir cream cheese into soup. Garnish with desired toppings.